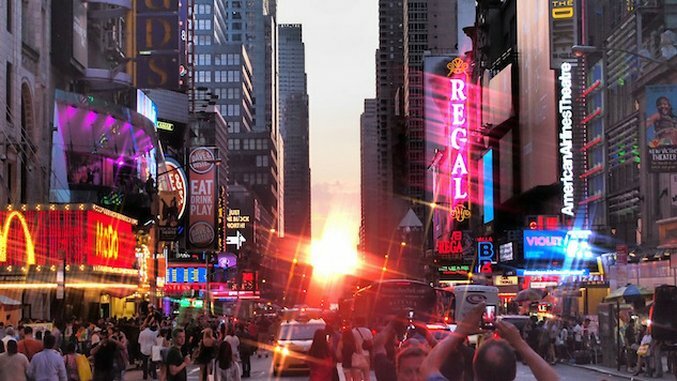 If you’re visiting New York City for the first time, you’re probably planning a visit to Times Square. And that’s OK; it’s something all travelers have to check off their bucket lists. Once you’re there, the physical battle of pushing through crowds and the smell of roasted nuts we do not recommend trying might fuel an appetite. What do you do now? Duck into Red Lobster or The Hard Rock Café? Join the crowd of confused eaters at Bubba Gump (“why is this place here? what is it’s significance? where’s Forrest?” are just a few of the questions you might have), or surrender to one of the 19 T.G.I. Friday’s in the area? Don’t panic. Just because you’ve found yourself hungry in the heart of Times Square doesn’t mean you have to suffer through an oddly themed meal. Believe it or not, there are some seriously good restaurants in the area, some of which tourists know nothing about even though they are right under their noses. With this breakdown of the best food around NYC’s theatre district (smack dab in the middle of the spring theater season), you’ll be eating like a real New Yorker—no inflated prices or tourists in sight—in no time. There are a handful of Michelin star restaurants in this area, but most of them are well-known amongst visiting foodies and often crowded with people taking photos of their meal. To avoid that, head to Danji, a small Korean take on the Japanese izakaya. With only 36 seats, it’s not the most comfortable dining experience, but who visits Hell’s Kitchen for comfort? The white-washed brick walls and dangling wooden spoons as art give the restaurant an Ikea look and a no-fucks-given feel, and that feeling translates into the dishes that taste and look like it took no effort to make them as perfect as they are. The menu—which is hidden in a drawer under the table—features modern and traditional dishes organized by size. We highly recommend opting for lots of small plates, as those are for what chef Hooni Kim is known. The loft-style setting with extremely high ceilings and exposed wooden beams will quickly take you out of Times Square and closer to a neighborhood like the West Village—where Toloache’s other venue lives. Multiple lanterns light the restaurant from the ceiling, and as you look down (or up, depending on what level your seated) you’ll lock eyes with the huge Latin lady painted on the wall in triptych formation. Continue down the wall following the tiles that make up the rest of it, until you get back to your table, which by this point is hopefully filled with authentic yet creative Mexican dishes like the Frutas Guacamole—featuring pomegranate, mango and habanero in addition to the avocado—and the Baja-style tilapia with spicy jicama slaw. If you’re feeling ballsy, go for the Chapulines, which are Oaxacan-style dried grasshoppers with onions, cilantro, jalapeño, salsa verde. Complete the meal with chef Julian Medina’s famed hibiscus margarita. Don’t let this tiny narrow space fool you; The Marshal’s menu is robust and its kitchen is powerful. This dimly-lit restaurant has been named one of the most eco-friendly restaurants in the city, thanks to their kitchen that relies solely on a brick oven—and since the restaurant’s small, you can get a good view of the chefs stuffing said oven from almost any seat in the house. The menu is farm-to-table and everything—including the alcohol—is super locally sourced. They even have a map and list of the farms they source from on the back of the menu. The agriculture-themed news clippings and art framed and hung on the walls make the experience complete. While any meat dish will please, if you want to be wowed, go for the simplest things on the menu, like the roasted carrots, which chef/owner Charlie Marshal turns into an eclectic dish with parsley verjus pesto. The same goes for the dessert; the basic s’more is elevated with maple-flavored marshmallows and dark chocolate chips. Italian isn’t hard to come by in this neighborhood—it seems like the go-to meal for tourists—but fluffy butter like Nizza’s is, so don’t feel bad if you fill up before you even order your meal. The tiny restaurant displays its expansive wine collection on the walls and in shelves carved into the geometric multileveled ceiling. Do yourself a favor and order the butternut tortellini soaked in brown butter and sage. Two brothers and a 37-year-old tree are just a few of the things that give Bea so much character. What seems like a small Hell’s Kitchen hole-in-the-wall is actually a warm and trendy restaurant that unfolds itself to you as you walk through. Let’s start in the main room, where the owners built a beautiful square bar and use potted plants to separate mismatched tables. The all-weather garden features a tree that was planted by the building owner for his daughter and the restaurant’s exposed brick walls frequently showcase foreign films. Bea is just a few blocks west of Times Square but the dim lighting and low-key customers make it feel worlds away.